Toyota has surprised the press at the North American International Auto Show with a new sports car concept called the FT-1. With it’s dramatic, swooping lines it’s certainly an outstanding looking concept and it could point towards a new generation of Supra, Toyota’s high-performance model, which hasn't been in production since 2002. 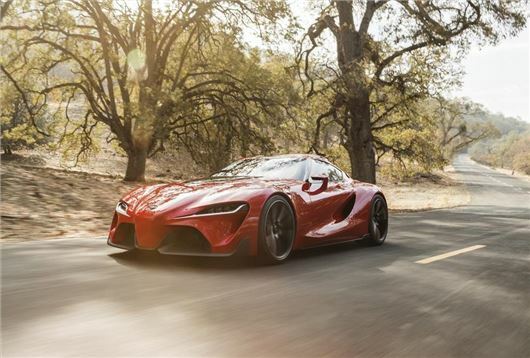 The front of the FT-1 takes cues from Formula 1 cars, with a prominent nose and a wide grille, along with a front wing and large air intakes. The rear of the car is equally as dramatic, with a big diffuser, retractable spoiler and more aerodynamic air intakes. The FT-1 is rear wheel drive in the tradition of most true sports cars, but there’s no news on what’s under the bonnet. The cabin features a Formula 1 inspired steering wheel and a colour head-up display (HUD), designed to project important information such as speed or engine RPM into the driver’s line of sight. The A pillars, which separate the windscreen and door glass, have been shifted back as far as possible to maximise visibility in corners. It’s unknown whether or not the FT-1 will make it into production. If it does then it’ll have as substantial power output to set it apart from the lesser GT86 sports car, but given Toyota’s usual approach it ought to be more affordable than the likes of a Porsche. We’ll stay tuned and bring you any further news about the FT-1 as soon as it’s announced.